Learn to recognize changes in the skin that could indicate skin cancer and educate your clients about the importance of early treatment. What is it? Skin cancer is a disease in which malignant cells form in the tissues of the skin. Though often treatable, it can cause serious and profound damage to the skin, or have far more serious consequences. Certain forms of skin cancer, such as squamous cell and melanoma, can metastasize (spread) to other areas of the body such as the lymph system and internal organs. Though treatable in the early stages, once melanoma spreads, the prognosis is not good. While there are different types of skin cancer, all are broken down into two categories: melanoma and non-melanoma. Melanoma is the most serious and accounts for about 4% of all cases. The other two common types of skin cancer are called basal cell carcinoma and squamous cell carcinoma. Both of these fall into the “non-melanoma” category. How do you get it? The cause of skin cancer is most often attributed to the sun, which puts us all at risk, but is especially problematic for those with fair skin that burns easily. However, multiple factors beyond the sun can play a role in the development of cancer. Genetics and viruses have been shown to trigger cancers. Other factors that may play a role are radiation therapy, medical conditions or drugs that suppress the immune system, skin conditions, and scars or burns on the skin. How is it treated? Treatment options depend on the following factors: the stage of the cancer (whether it has spread deeper into the skin or to other places in the body), the type of cancer, the size of the tumor and what part of the body it affects, and the patient’s general health. Small skin cancers limited to the surface of the skin may not require treatment beyond an initial skin biopsy that removes the entire growth. Other cancers may require surgical treatment. If surgery isn’t indicated, other possible treatments include immunotherapy, cryosurgery, chemotherapy, photodynamic therapy, and radiation therapy. What can a tech do? When examining clients’ hands, watch for changes of color. 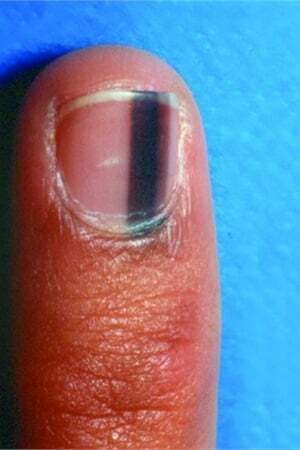 Black is associated with melanoma; however, any change in color should send an alarm. If all of a sudden the skin under or around the nail starts to look different, it is time to have the area examined by a physician. Cancers under the nail tend to be painless, slow-growing, and often very subtle, so the client might miss it. Look carefully at the nails each visit with a fresh, unbiased perspective, and if you suspect something is wrong, recommend a medical consultation. What else? Look for the “ABCD” warning signs: the spot will be Asymmetrical (one half doesn’t mirror the other); the Border will look like it’s spreading instead of having sharp edges; there will be Color variations in the spot, possibly with a very dark, black area. Finally, evaluate the Diameter. Though the area can be smaller, when it is the size of a pea or a pencil eraser, there is a higher possibility that the spot is malignant. The ABCD test is often referred to when trying to assess if a spot is a melanoma. Other types of skin cancer, such as basal cell carcinoma and squamous cell carcinoma appear on the skin differently. Look for elevated growths that don’t seem to heal, or crusty, scaly, enflamed areas on the skin. Rashid M. Rashid, M.D. contributed to this article.